This area of Italy is known at Emilia-Romagna, also known as Italy’s breadbasket where Parma ham, aged balsamic vinegar and other amazing food is found. 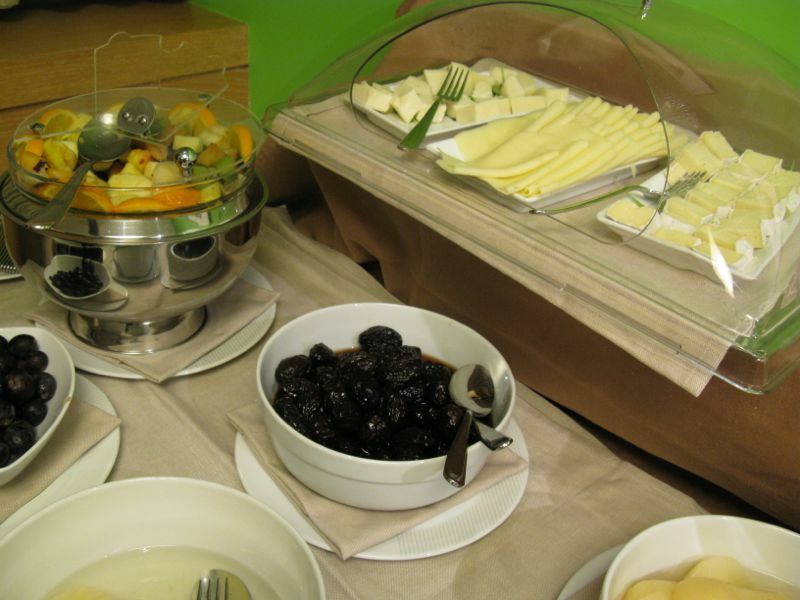 But this is what we got on the way there, the airplane breakfast: hard roll, not-bad omelet and potatoes and iffy fruit. 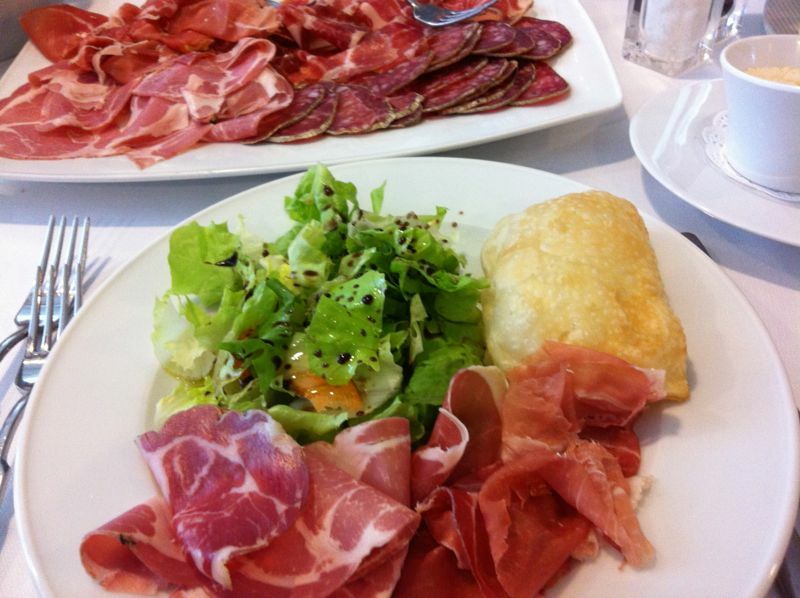 Duly prepared, our first meal in Carpi was a feast of Emilia-Romagnan fame. 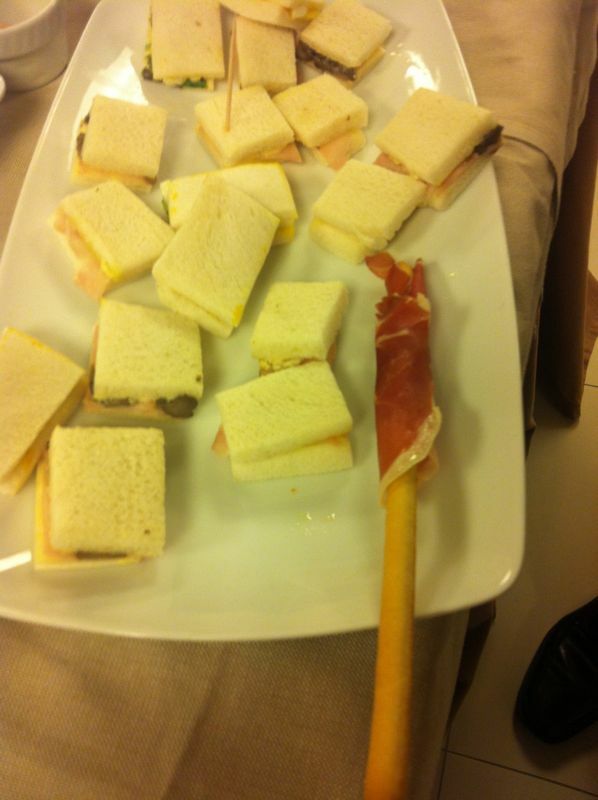 It began with a reception with little snacks, and my favorite was the prosciutto wrapped around a grissini–a crispy breadstick. 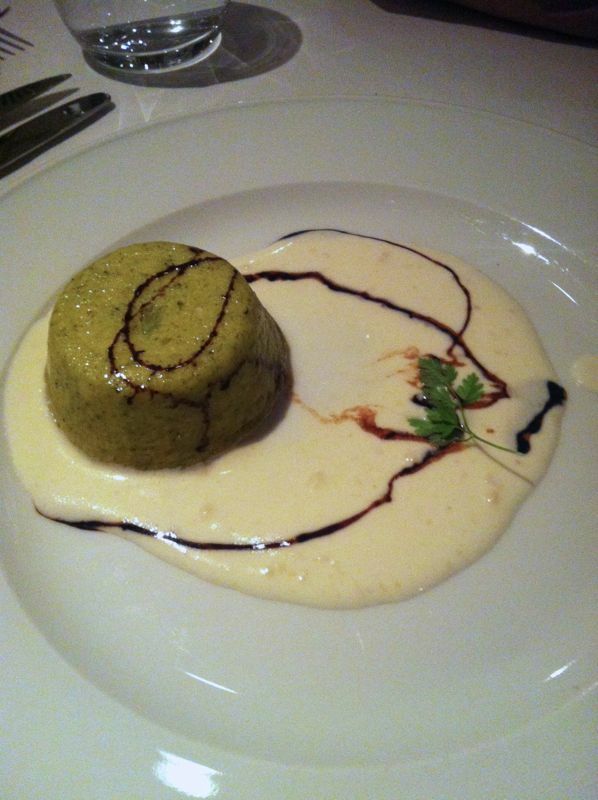 After the reception, we were sent into the restaurant area where long tables were set with crisp white tablecloths, and set before us was a broccoli mousse in a white sauce, with what looked like chocolate drizzled over it. Chocolate? I take my fork, dip into the dark liquid–it’s vinegar, but rich and almost a sweet rich taste. This blurry picture is the oil and vinegar that were on our table. 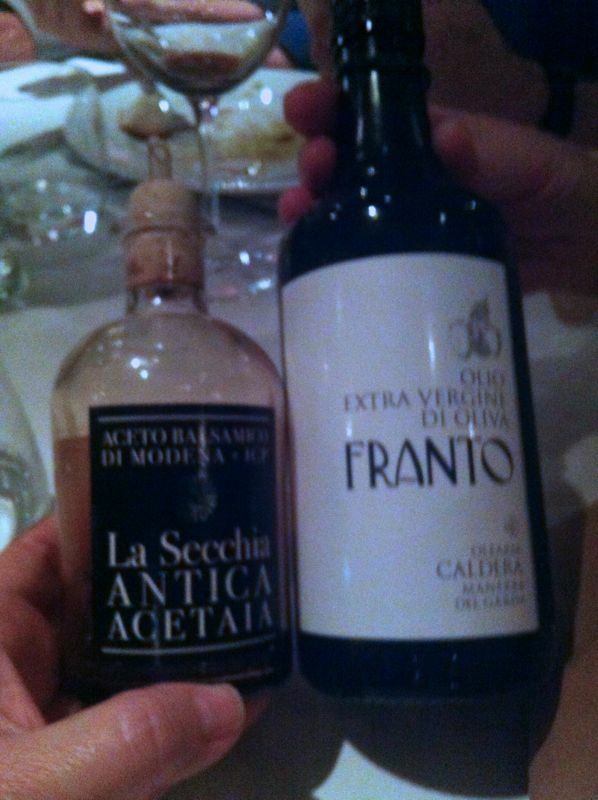 This was my first introduction to aged balsamic vinegar and it was a revelation. We had a rich lasagna for the next course, then a knuckle of pork, both of which I only had terrible pictures (nothing worse than terrible food pictures). 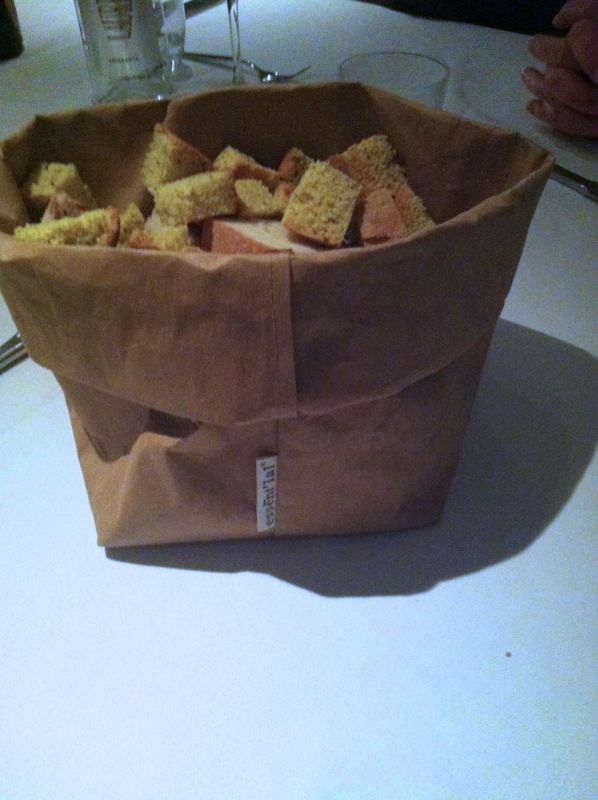 This was the breadbasket–a supple cloth-like paper basket filled with chunks of bread–which I used to sop up the delicious vinegar on the bread plate. Our dessert — after 2 hours of eating — was a rich, flourless chocolate cake, with languid marscapone cream. 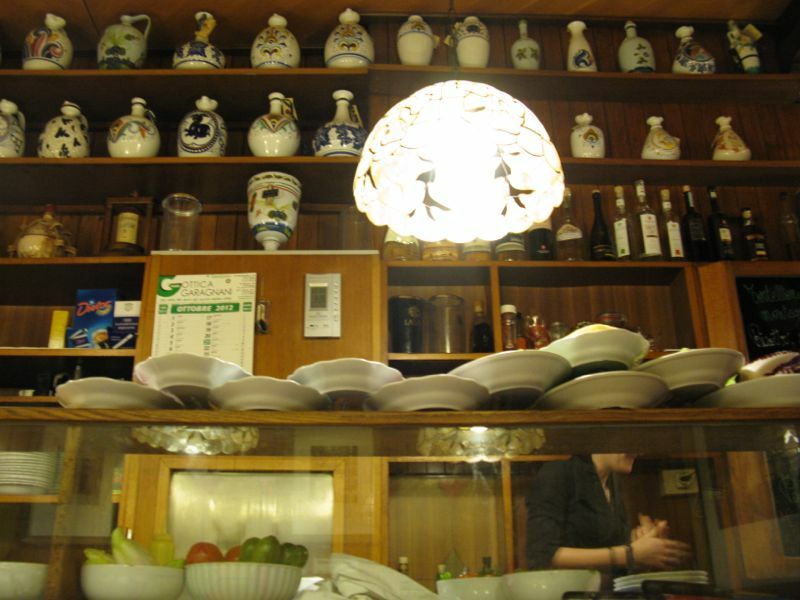 We’d been eating for 2 1/2 hours, talking over the alcohol-enriched voices of those around us. We went upstairs to our room, ate a Tums antacid, then fell into bed. The morning’s breakfast was a spread of everything breakfasty under the sun, including these golden-orange eggs, sunnyside-up. 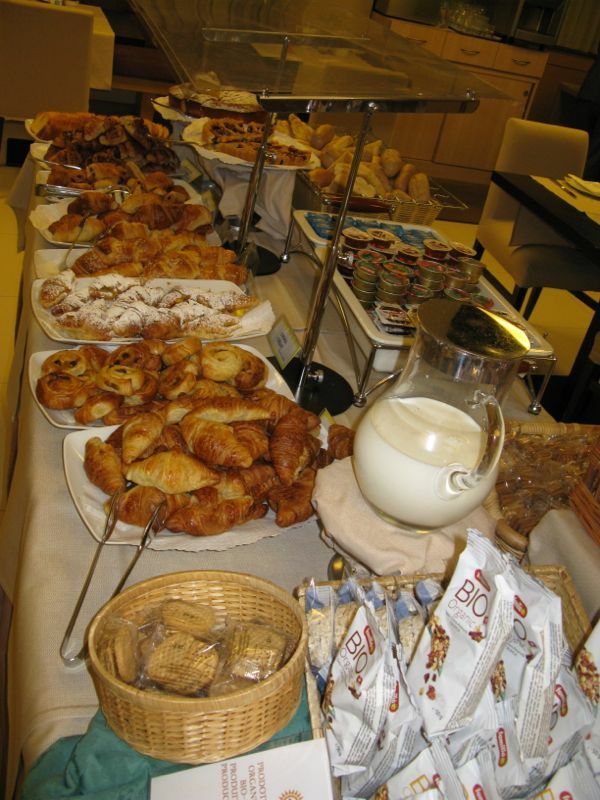 I’ve been to a lot of hotels and bed & breakfasts, but this was a vast array of delicious food items. 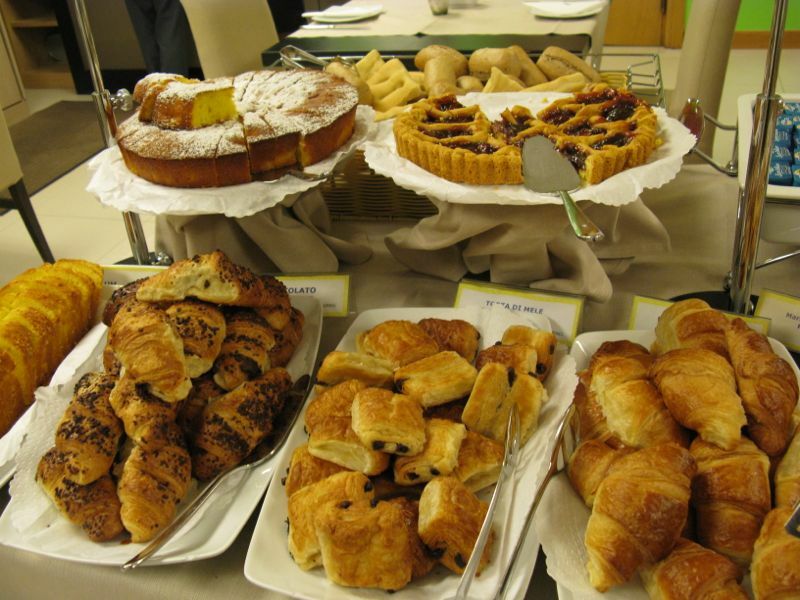 Croissants of all kinds: plain, chocolate and raisin along with some breakfast cakes. Good thing we don’t eat like this every day! 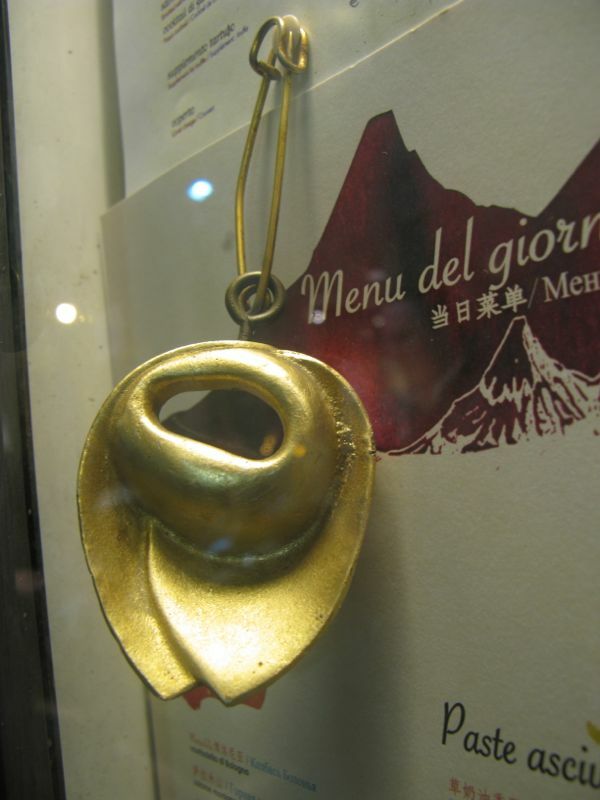 I don’t think the Italians eat this way for breakfast, either. I imagine they have to have the meats for the Germans, the croissants for the French, and the cold cereals for the Americans. 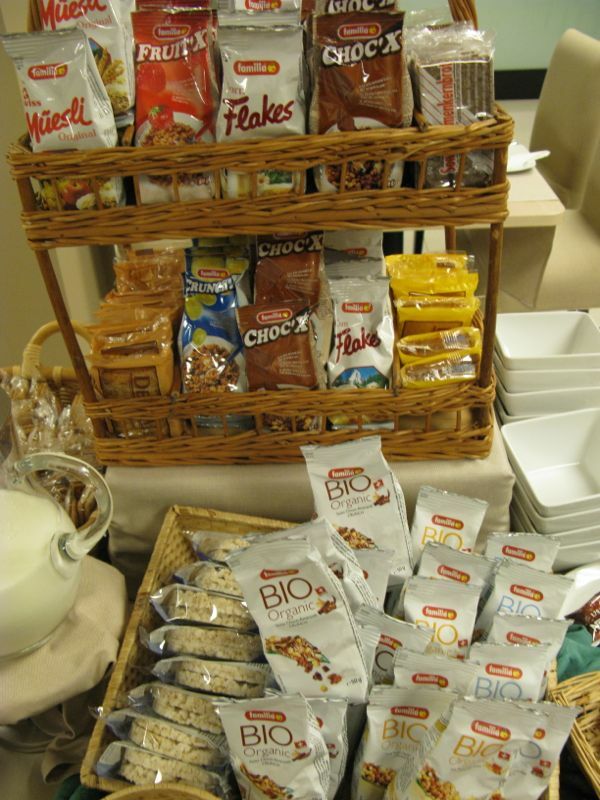 Pretty pathetic that we are the cold cereal people. 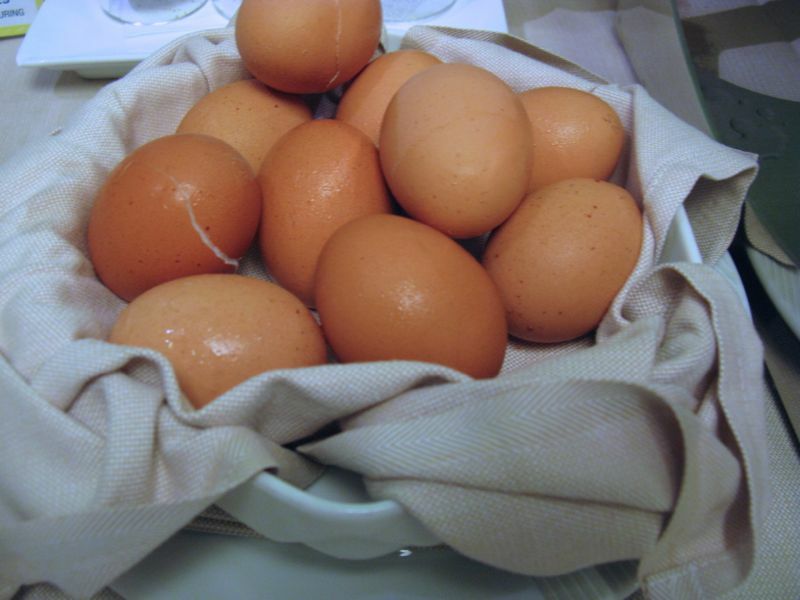 Maybe we can own the scrambled eggs, too. 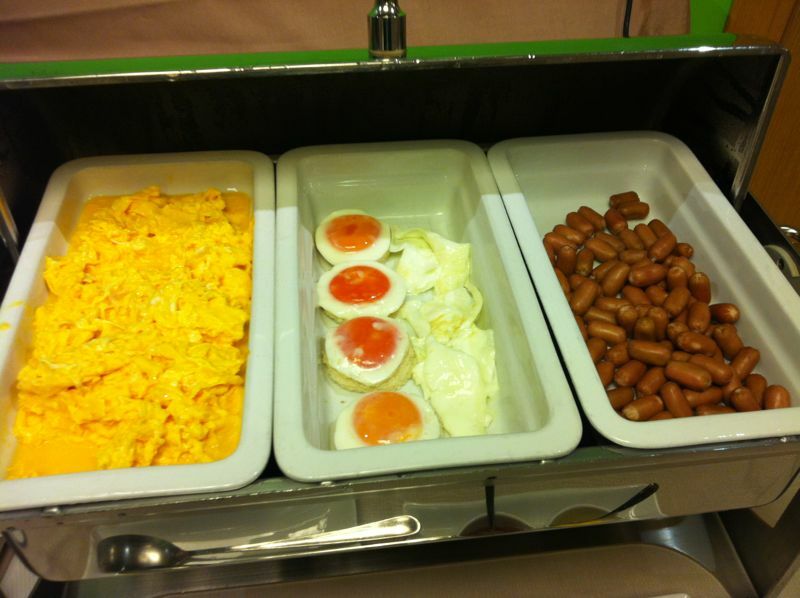 Or those beautiful sunnyside-up eggs of golden orange. 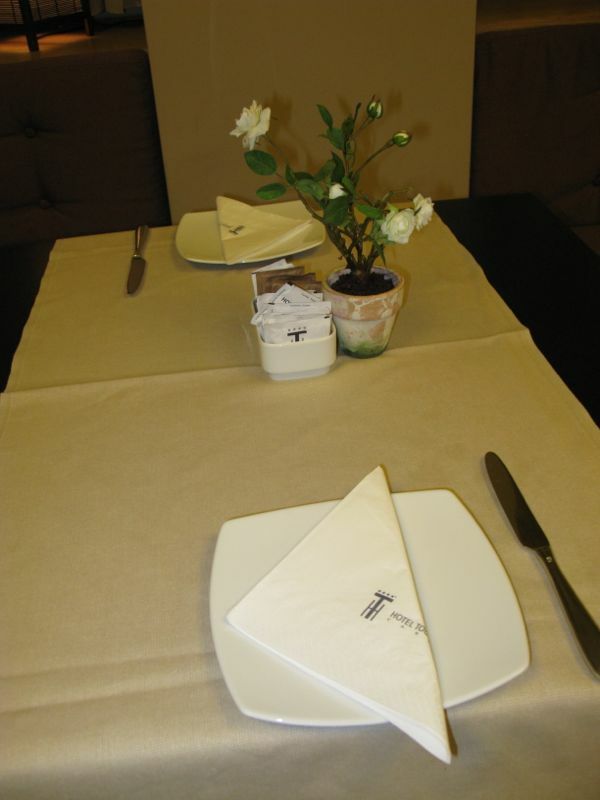 The tables were set with beige linen, square plates and a tiny potted plant. 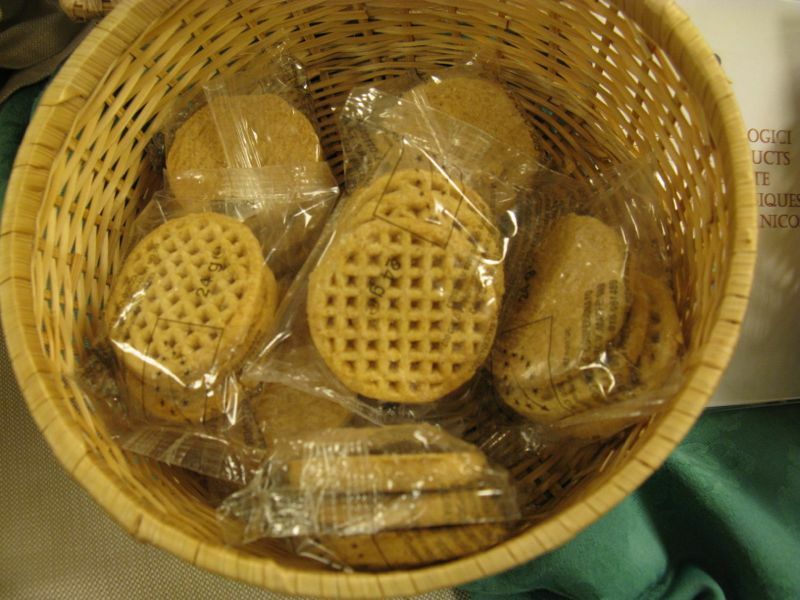 These were little shortbread biscuits, two wrapped in cellophane. I snagged a couple for my backpack and it came in handy later on. 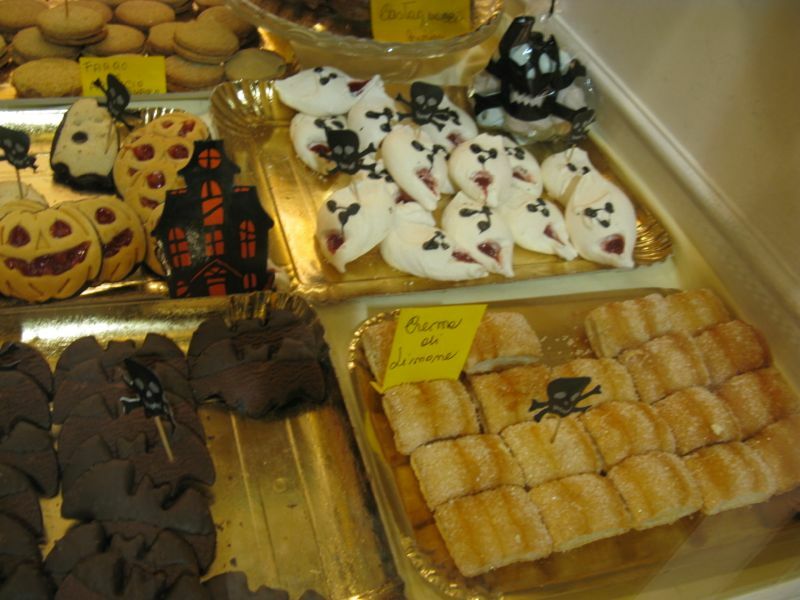 When I went out walking in Carpi that day, they had Halloween Cookies for sale–love the molten liquid mouths of the ghosts. 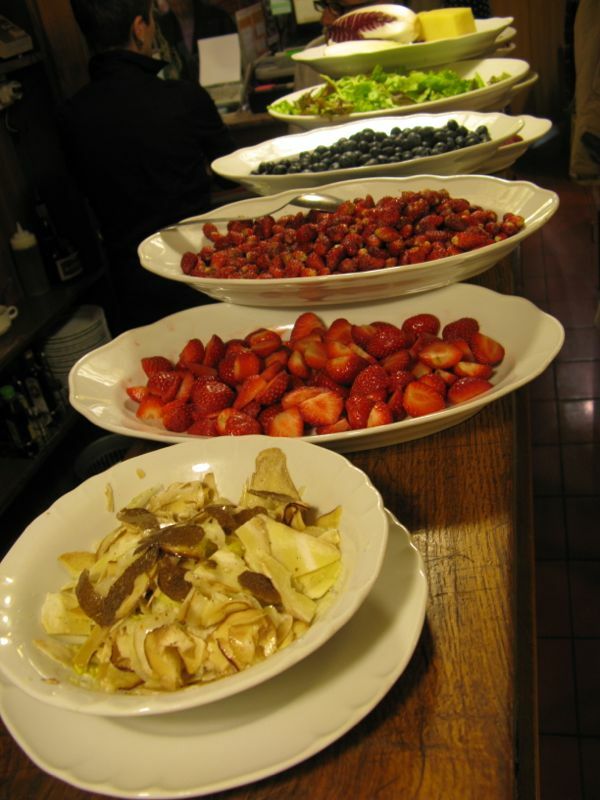 This was the day we went out to the Vinegar Farm (see the Carpi post), and came back to a luncheon in the restaurant of salad, grilled endive, a pasta dish with vegetables (like a deli salad), and last night’s leftover flourless chocolate cake along with bite-sized fruit tarts. That night we had a banquet in a local hotel/restaurant. The first course was a variety of grilled vegetables, and firm polenta cut into bite-sized cubes and browned on all sides. About this point, another group joined us in this banquet hall and the noise level went from noisy to WAY noisy, and the pace of the servers picked up to frantic. 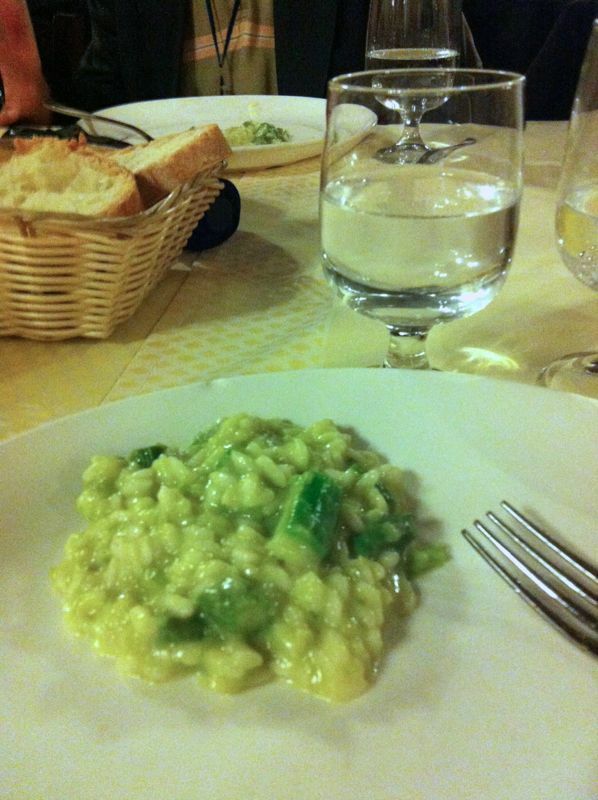 Our section of the long banquet table nearly missed the second course of risotto with asparagus. Very creamy, but it was interesting how there was a gritty bite to the risotto–not how we serve it in the states. Salads came next drenched in that luscious balsamic vinegar from the region, but we had to practically do a dance on the table to get salad served to us. I politely held it for the lady next to me, who then whisked it on down the table, and then I had ask firmly to get it back. Please. I needed it, for they came around with platters of dry roasted pork, and the dressing from the salad helped out that bleh entree. 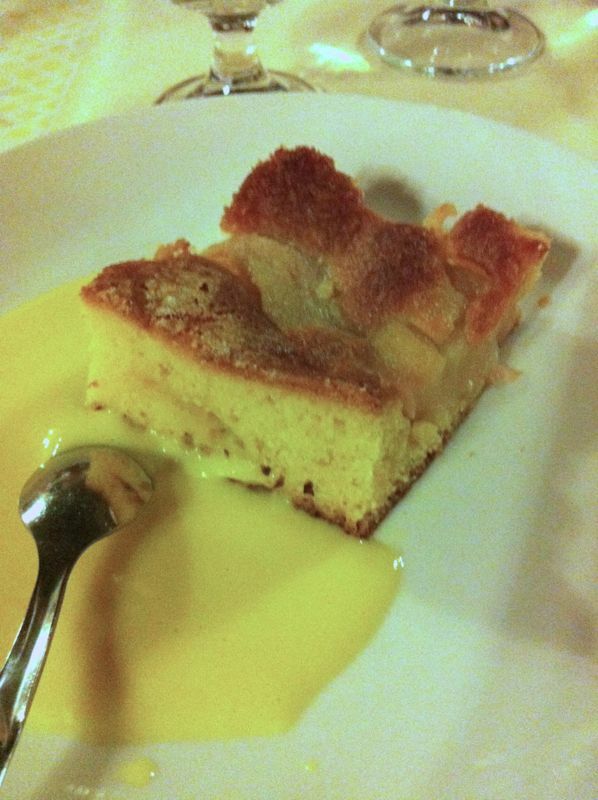 They redeemed themselves a little on the dessert: apple cake with cream anglaise. I could tell things were difficult in the kitchen for my spoon was a demitasse spoon–what we’d use to serve our babies their food. Teensy. 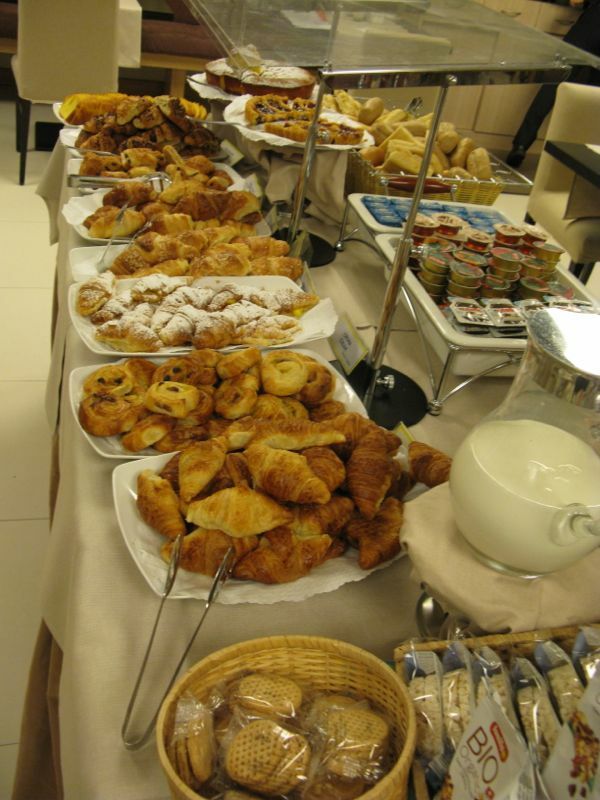 The next morning, was the breakfast spread (see above), but still stuffed from the last two days, I had a streamlined version–very streamlined. Lunch was our final meal together. They started with a platter of these cured meats, and no I don’t know the names of all of these, but they were light and delicious. 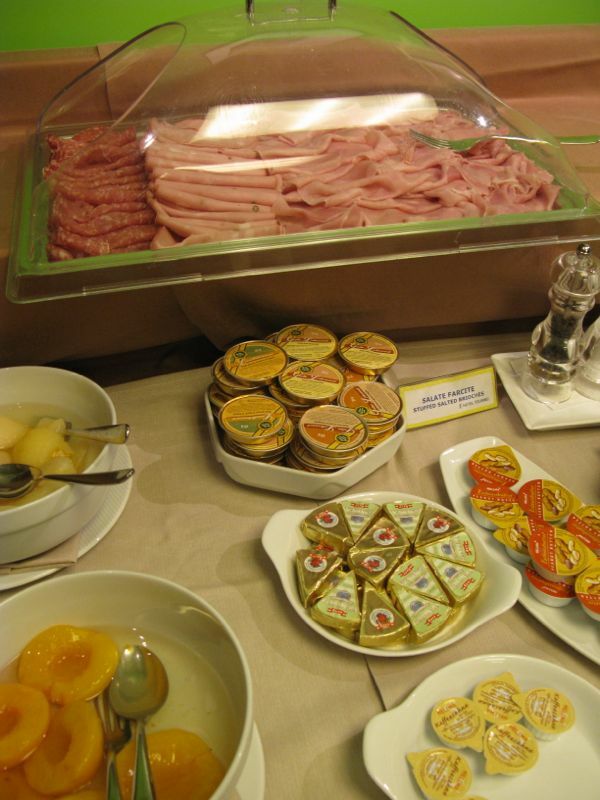 I have to assume some of it was salami (in lower right), prosciutto (in upper left). I had that, mostly. 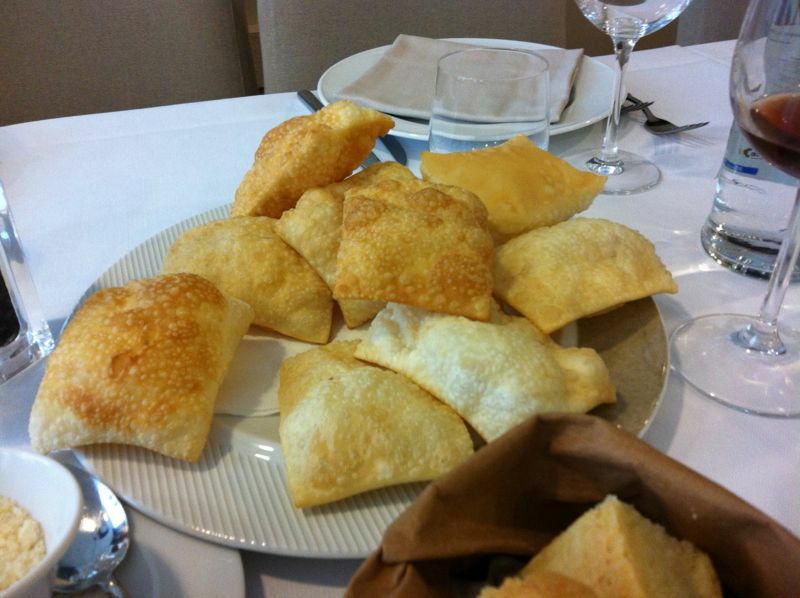 We were served gnocco fritto–little puffy, light-as-air bread pockets. We ate them alongside the meats, but sometimes people open them up, stuff the meats in them and eat them like little sandwiches. If only we had known. . . They had put red wine vinegar on the tables for lunch, but I convinced a server to bring me the balsamic vinegar, which you see drizzled above. 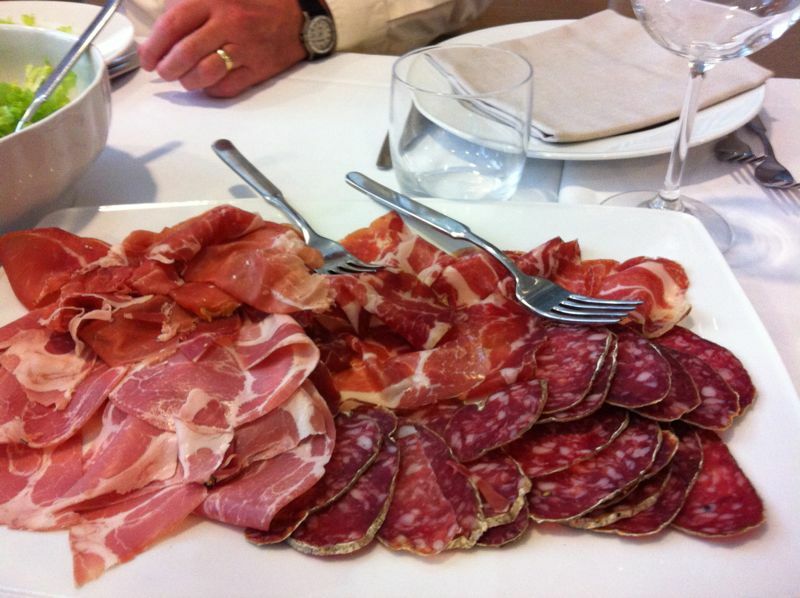 Dave and I each had two platefuls of the above, but then they took away the meats, salad and gnocco fritto. I guessed we were done, but no. . . we had another course coming. 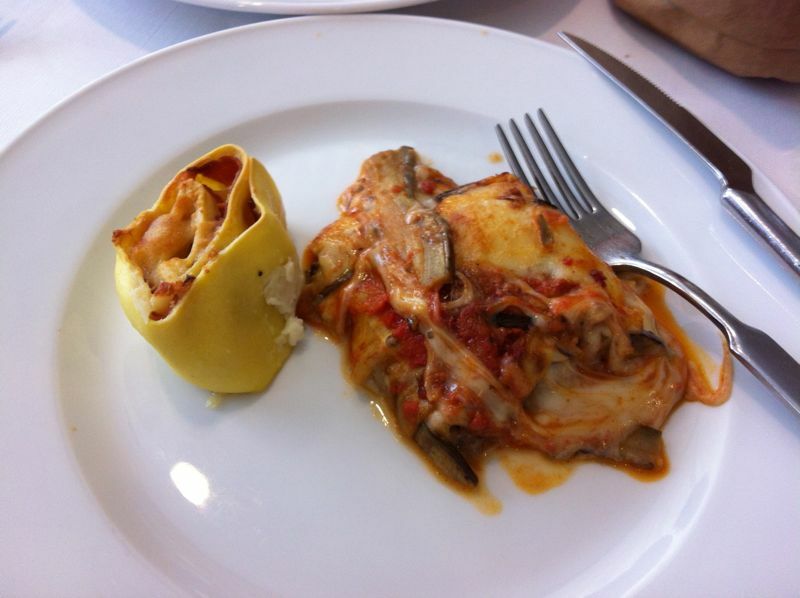 A rolled up pasta filled with a light tomato sauce and cheese, as well as a rich and luscious lasagna. At this point, the clock was running out and we were supposed to be out in the van for our ride to Bologna, so I wolfed down the rolled pasta and left the rest. I kept wondering what they would bring out for dessert, but I was stuck in the van for the next 45 minutes, while we waited for others to arrive, so never found out. Of course, it was at this point, realizing that I’d never have that amazing vinegar again, that I wished I had persevered at the Vinegeria Farm and purchased some. Luckily we were still in the area for another couple of days and I determined to look for some. 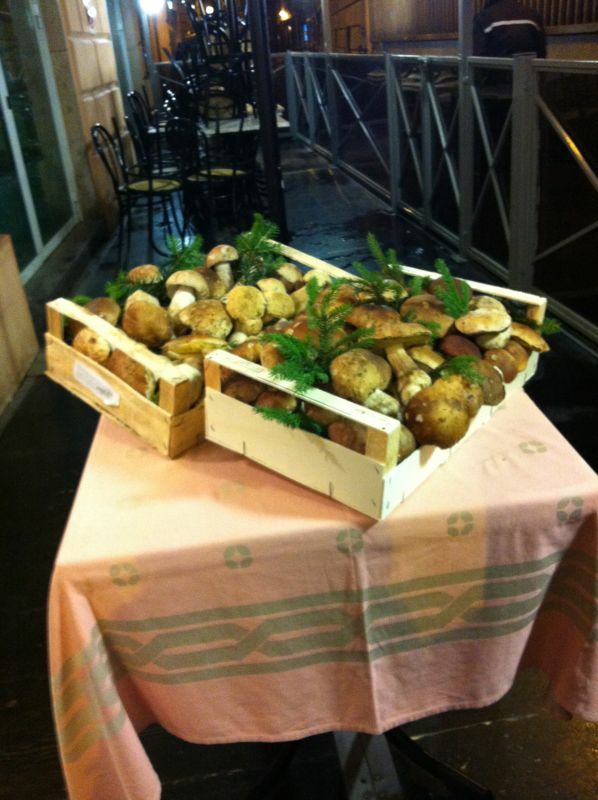 In Bologna, we ventured out that rainy night to Da Nello, a place recommended by the hotel and these crates of mushrooms were on the table in the abandoned front “porch” or eating area. I could imagine it full of tourists in the summer, for this was a place with a menu in seven languages–a telltale giveaway that this is a “tourist” restaurant. Dinner breads on the table. 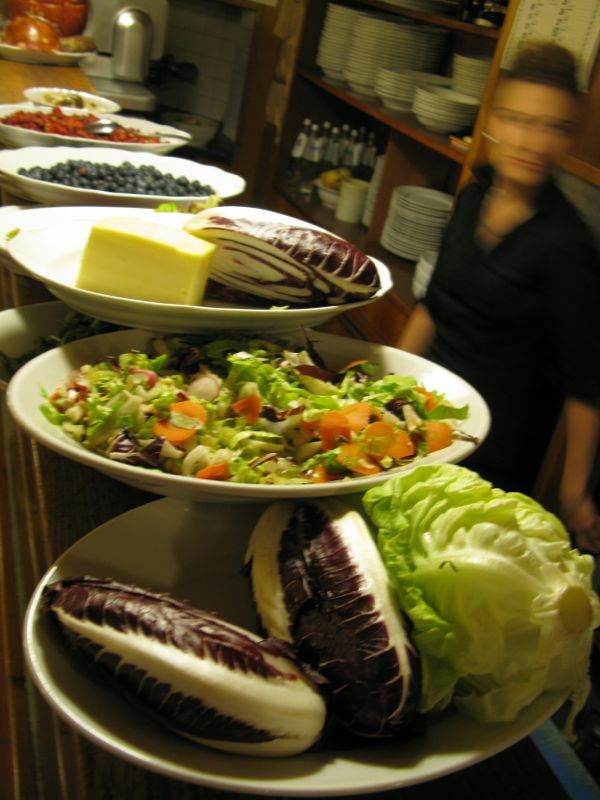 We shared a salad, which the young woman made by gathering together our lettuce, then reaching up and taking things from the stacked plates on the counter. None of those pesky food-safety gloves for her. Later on I took a photo of them. 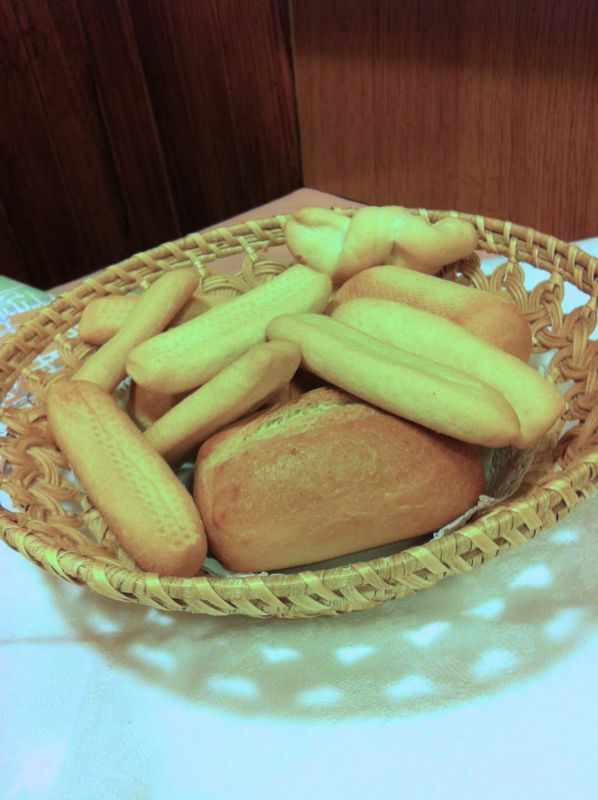 The one closest to us is mushrooms, then strawberries, raspberries(? 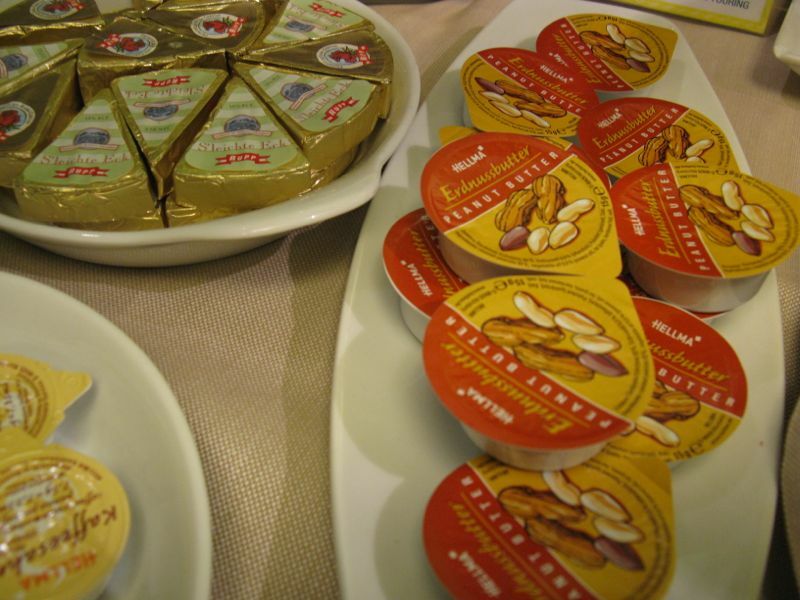 ), and regular salad fixings. A view from above from the other end of the counter. I’m sure she thought we were nuts. 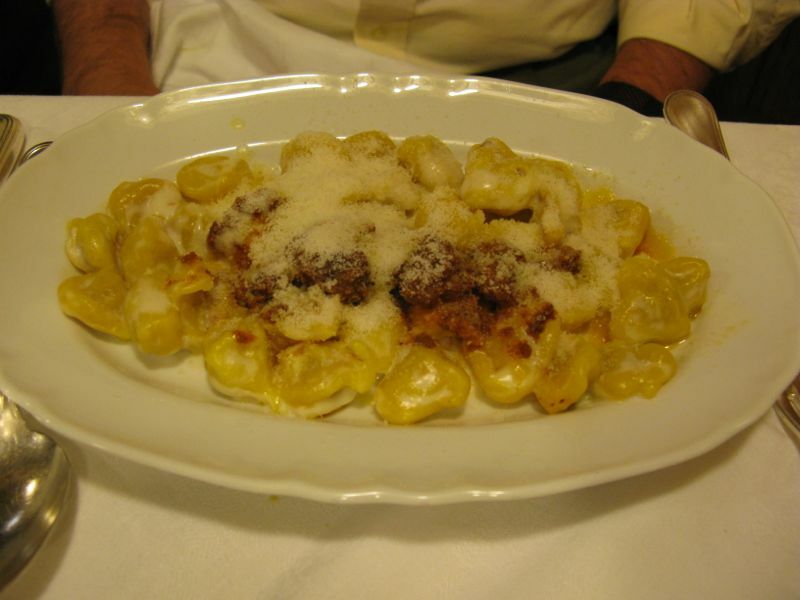 Dave had pasta Bolognese–it looks like tortellini from this (dimly lit) photo. 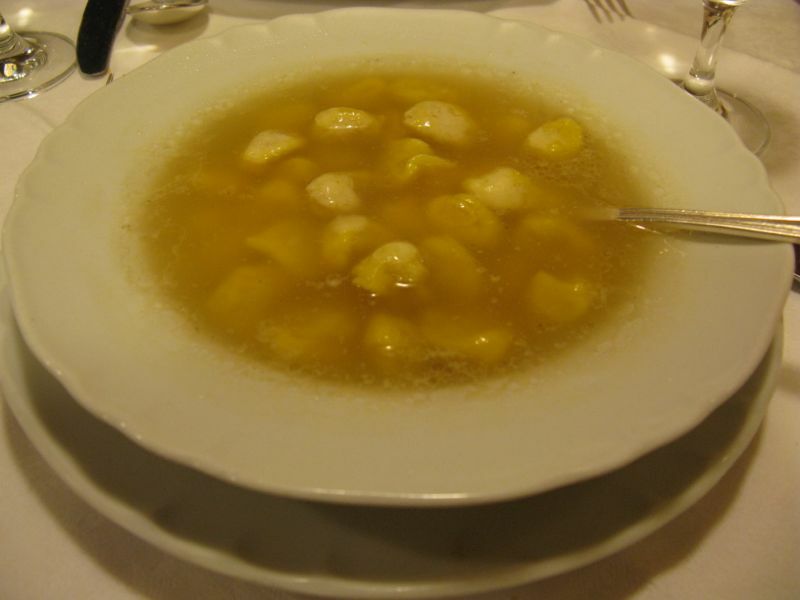 I had a dish recommended to me by the man at the hotel: Tortellini en Brodo: tortellini in broth. The server sprinkled a little cheese over the top, and it all melted into a delicious warming supper. It was more satisfying than I ever thought. Italy 2012, to be continued.